There are many more things than just planning a meal in the catering department, and these tasks are accomplished by the Director of Catering. 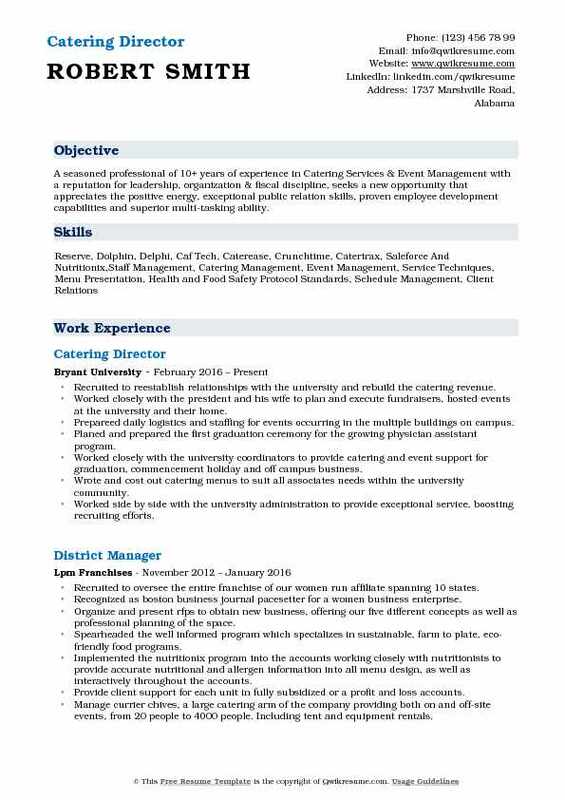 The Catering Director resume mentions list of associated job duties such as – assessing event and client’s needs, choosing appropriate facilities based on size and event, staying within the budget, overseeing staff, coordinating with customers about hosting wedding receptions, banquets, events or specific parties; delivering various menu and room options, arranging and planning details of banquets, checking and double checking the allotted dates, cultivating new customers, working with staff, forming and reviewing budgets and negotiating prices. 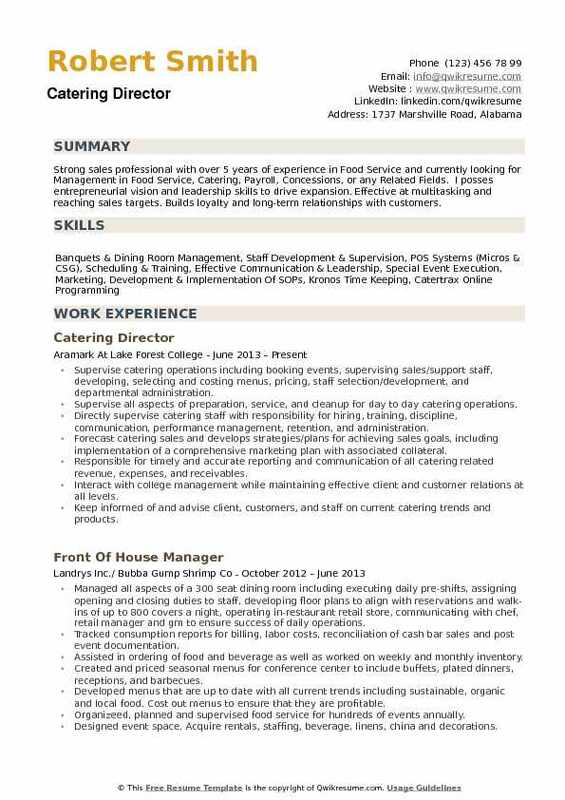 The Catering directors are supposed to exhibit certain qualities in the resume such as – nutrition knowledge, organization skills, ability to reach sales goals, extensive knowledge of food and beverage, good estimation capabilities, familiarity with related software, acute financial management skills, and time management skills. Most of the Catering Directors hold a two or four-year degree in the field of catering or hospitality management. Headline : Highly talented Sales Manager with great experience in Catering Contracts and Banquet Event Orders, developing and implementing total sales and marketing efforts. Including securing new accounts, maintaining existing accounts, and assist in executing sales and marketing strategies to maximize the profitability of the business while maintaining customer satisfaction. Developed catering contracts, banquet event orders, proposals and customized menus to meet client needs as well as financial goals. Exceeded catering revenue goals by actively up-selling each business opportunity. Maintained past and potential accounts by calling or emailing to assess ongoing needs of prospective clients for catering services. Exceeded monthly revenue goals; goal last year was $967,345,99 and produced $1,390,345 in total revenue for the year. Assisted the client in menu planning; coordinates food, beverage, meeting room set up, diagrams, decorations and other services as requested by the client. Inspected finished arrangements before an event; often present to oversee the actual service and greeting of contact. Coordinates with the food and beverage director to ensure proper execution of catering events. Investigated food quality and service complaints, ensuring customer satisfaction and repeat business. Analyzed BEO’s to effectively communicate with clients, managers and, associates to ensure that room setups, staffing, and menus meet and exceed guests expectations. Orchestrated and conducted weekly BEO meetings to review upcoming private events with department heads. 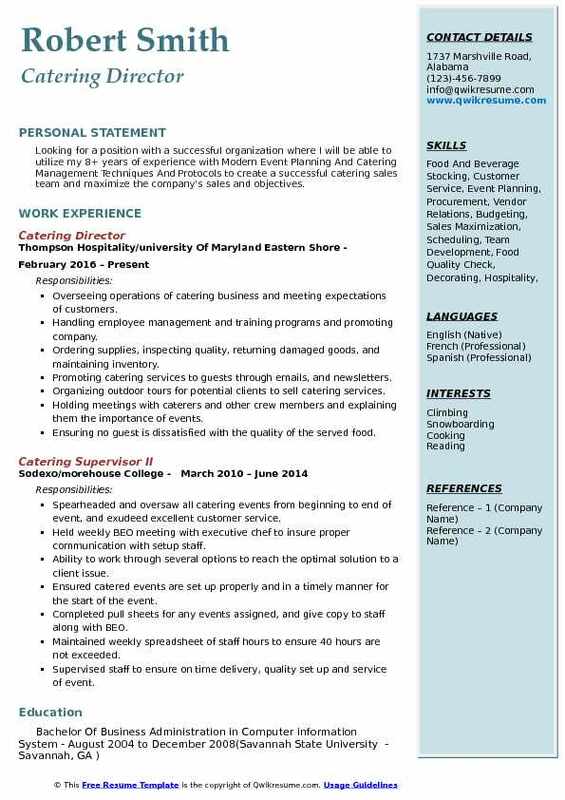 Summary : Adept Event Coordinator with over 13 Years Of Experience In Managing Corporate And Personal Catering Events Ranging In All Sizes From 30 To Over 4000 Guests, Looking to obtain a position as a Catering Director within your company where my education and years of experience will be of value to the organization and those it serves. Promote, advertise and market the club’s social event facilities and capabilities to all members. Help clients arrange banquets, luncheons, meetings, weddings, dances and other social events, obtains pertinent information needed for guest planning. Provide member and non-member tours and suggestions to sell the club’s facilities for events. Work with the executive chef to determine selling prices, menus and other details for catered events; oversees the development of contracts; assures that pre-planned banquet menu offerings are current and reflect member interests. Suggest and help plan event menus with the executive chef or other culinary personnel. Develop a catering sales plan, reviews financial reports and takes corrective action as appropriate to help ensure that booking goals are achieved. Attend senior staff and food/beverage meetings to review policies and procedures, future business and to continually develop quality and image of banquet and catering functions. Track new products and trends in food service and catering applicable to the club. Inspect all event setup and banquet rooms to ensure they are properly set and ready for upcoming shifts/events according to operating procedures and/or beo’s. 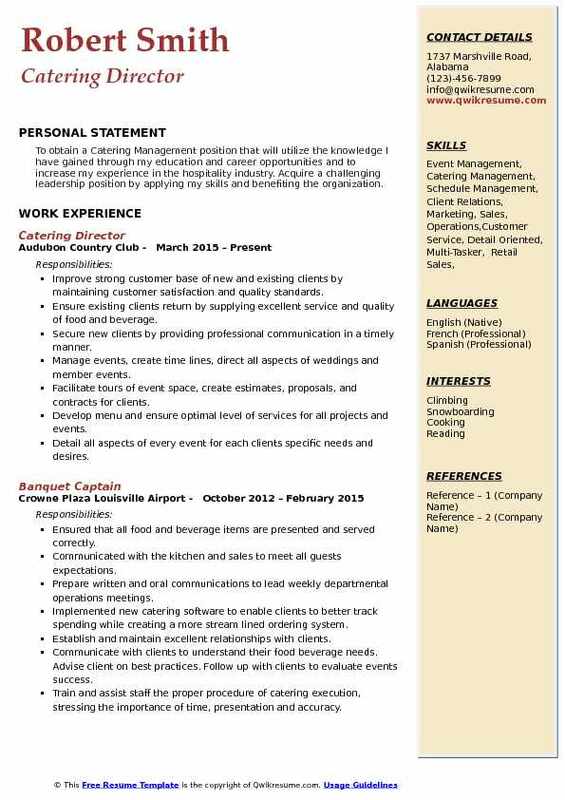 Summary : Hospitality professional of 8+ years with special interest in food and beverage management. Experience includes residential and retail dining, catering operation and sales, special events and functions, production of ordering and inventory, scheduling and hiring, vendor compliance and retail cost analysis. Communicating with clients through email and phone based on clients preference. Setting up and running events for numbers ranging from 5 people to 1600 people. Overseeing the entire catering department which includes personally verifying that events are running smoothly and helping get events set on time if needed. Staffing and scheduling for events based on the type of event such as a reception, plated meal, buffet. Leading teams of temporary associates from temp companies, including quick trainings in procedures and quality standards. Daily ordering of products, small wares, rental units, china, and linen. Experience creating invoices for customers and billing, giving quotes for service. Helped launch the catertrax program and introduced it to the clients to provide web-based access to ordering and requests. Attending community events/activities and chamber meetings in order to market and build business. 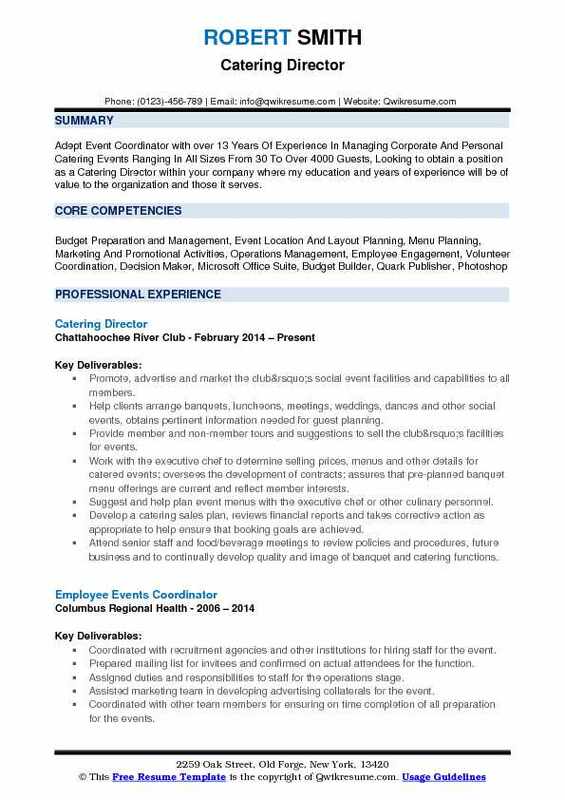 Objective : Seasoned Event Planning Professional with 6+ years of experience in Event and Banquet Management, seeking to obtain a position where my professional experience, educational background, and strong work ethic will allow me to make an immediate contribution as an integral part of a successful company. Overseeing the operations of the catering department as well as implementing strategic planning processes to contribute to the growth and success of the department and the company as a whole. Planning, directing, and coordination of catered events for a network of 20 private schools in the NYC metropolitan area. Preparing the departmental budget and financial forecasts, operating within set monetary parameters, ensuring effective cost. Effectively maintain event staffing schedules and streamlining standards throughout the department. Establish and maintain rapport with clients, prior to, during and post-event; exceeding their expectations. Oversee the catering calendar, manage a high volume of meetings including but not limited to site inspections, menu. Conduct periodic departmental audits to ensure adherence to core standards. Conduct and implement all training programs for the department to ensure that all existing and new employees are. 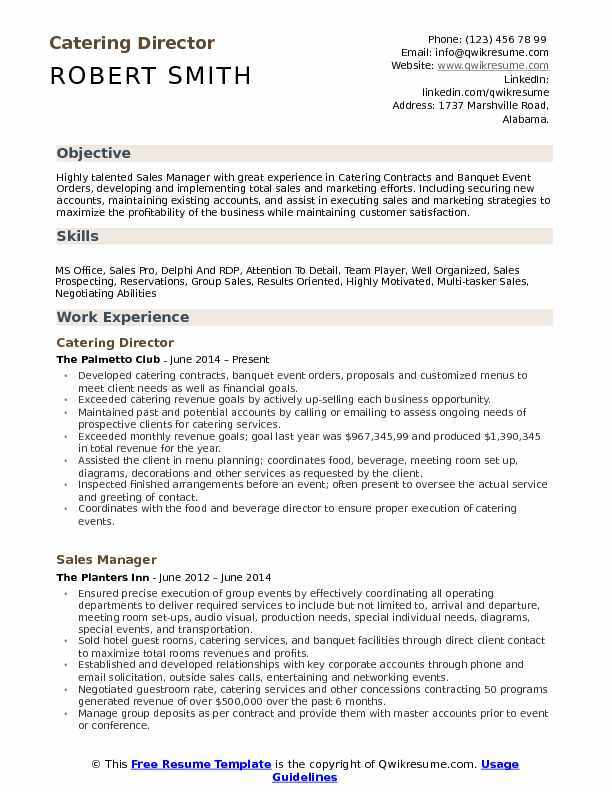 Summary : Looking for a position with a successful organization where I will be able to utilize my 8+ years of experience with Modern Event Planning And Catering Management Techniques And Protocols to create a successful catering sales team and maximize the company's sales and objectives. Overseeing operations of catering business and meeting expectations of customers. Handling employee management and training programs and promoting company. Ordering supplies, inspecting quality, returning damaged goods, and maintaining inventory. Promoting catering services to guests through emails, and newsletters. Organizing outdoor tours for potential clients to sell catering services. Holding meetings with caterers and other crew members and explaining them the importance of events. Ensuring no guest is dissatisfied with the quality of the served food. Increased revenue by 33% within my first fiscal year by introducing custom menu options and new. Decreased labor cost by not using temps, but instead utilizing retail and board staff. Met with executive chef weekly to discuss inventory, so menus could be created based on in-house items so food cost would be at a minimum. Summary : A seasoned professional of 10+ years of experience in Catering Services & Event Management with a reputation for leadership, organization & fiscal discipline, seeks a new opportunity that appreciates the positive energy, exceptional public relation skills, proven employee development capabilities and superior multi-tasking ability. Recruited to reestablish relationships with the university and rebuild the catering revenue. Worked closely with the president and his wife to plan and execute fundraisers, hosted events at the university and their home. Prepareed daily logistics and staffing for events occurring in the multiple buildings on campus. Planed and prepared the first graduation ceremony for the growing physician assistant program. Worked closely with the university coordinators to provide catering and event support for graduation, commencement holiday and off campus business. 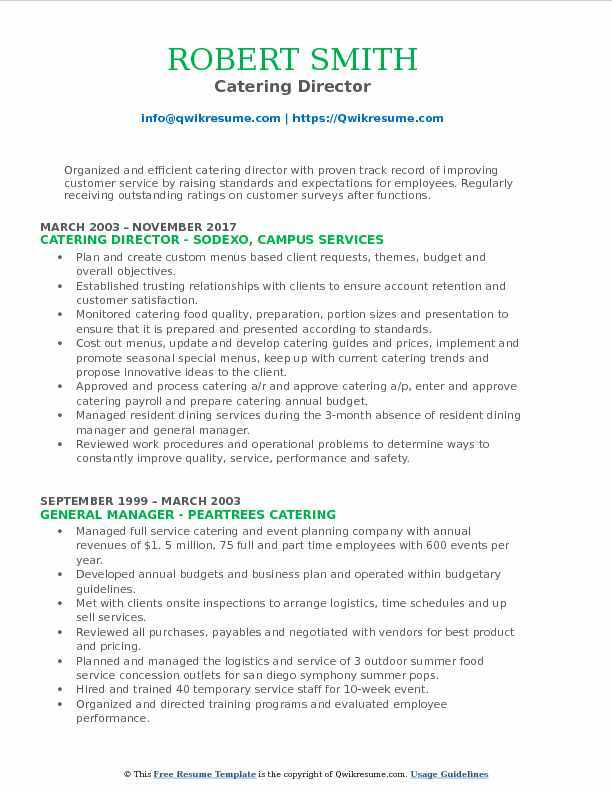 Wrote and cost out catering menus to suit all associates needs within the university community. Worked side by side with the university administration to provide exceptional service, boosting recruiting efforts. Closely worked with athletics providing upscale banquets and tailgates surrounding all sporting events. Order, manage and maintain a large inventory of catering supplies, linens and decor. 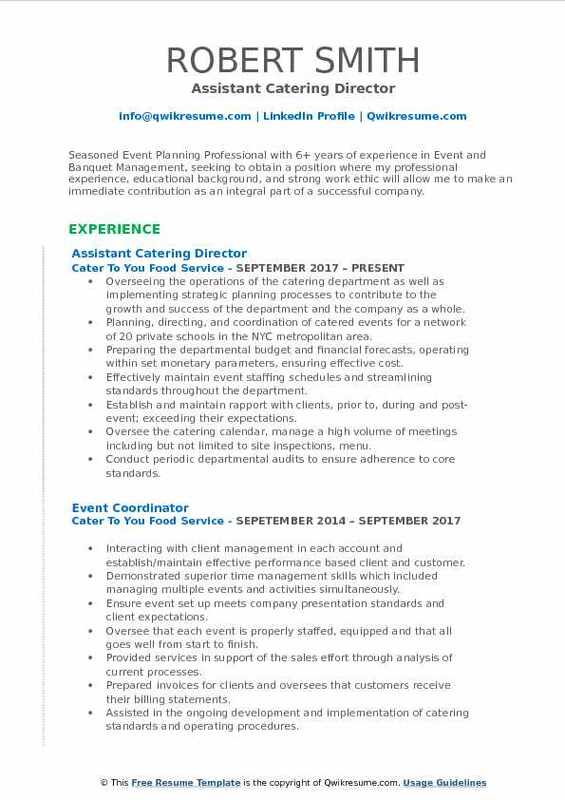 Summary : Organized and efficient catering director with proven track record of improving customer service by raising standards and expectations for employees. Regularly receiving outstanding ratings on customer surveys after functions. Plan and create custom menus based client requests, themes, budget and overall objectives. Established trusting relationships with clients to ensure account retention and customer satisfaction. Monitored catering food quality, preparation, portion sizes and presentation to ensure that it is prepared and presented according to standards. Cost out menus, update and develop catering guides and prices, implement and promote seasonal special menus, keep up with current catering trends and propose innovative ideas to the client. Approved and process catering a/r and approve catering a/p, enter and approve catering payroll and prepare catering annual budget. Managed resident dining services during the 3-month absence of resident dining manager and general manager. Reviewed work procedures and operational problems to determine ways to constantly improve quality, service, performance and safety. Scheduled staff hours and assign duties, maintain and inventory equipment and order specialty food items. 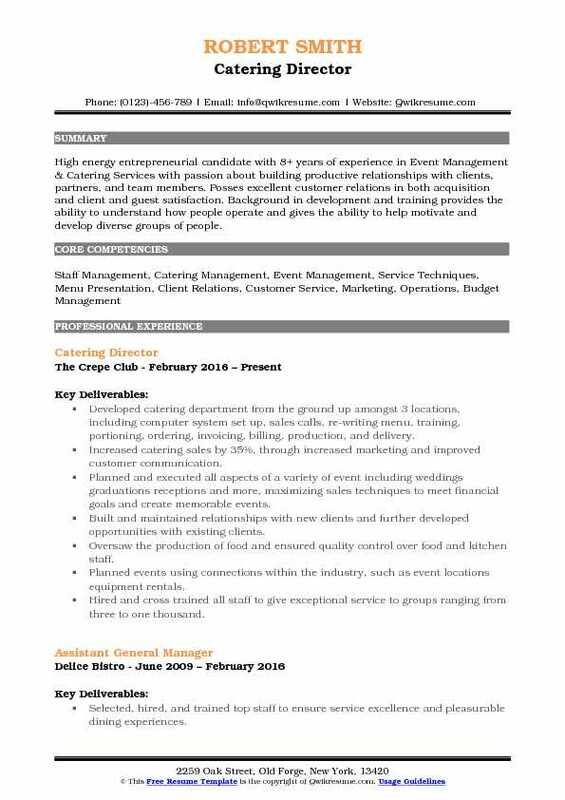 Summary : High energy entrepreneurial candidate with 8+ years of experience in Event Management & Catering Services with passion about building productive relationships with clients, partners, and team members. Posses excellent customer relations in both acquisition and client and guest satisfaction. Background in development and training provides the ability to understand how people operate and gives the ability to help motivate and develop diverse groups of people. Developed catering department from the ground up amongst 3 locations, including computer system set up, sales calls, re-writing menu, training, portioning, ordering, invoicing, billing, production, and delivery. Increased catering sales by 35%, through increased marketing and improved customer communication. Planned and executed all aspects of a variety of event including weddings graduations receptions and more, maximizing sales techniques to meet financial goals and create memorable events. Built and maintained relationships with new clients and further developed opportunities with existing clients. Oversaw the production of food and ensured quality control over food and kitchen staff. Planned events using connections within the industry, such as event locations equipment rentals. Hired and cross trained all staff to give exceptional service to groups ranging from three to one thousand. Maintained close relationship of vip clients such as asu, chase state farm. Headline : To obtain a Catering Management position that will utilize the knowledge I have gained through my education and career opportunities and to increase my experience in the hospitality industry. Acquire a challenging leadership position by applying my skills and benefiting the organization. Improve strong customer base of new and existing clients by maintaining customer satisfaction and quality standards. Ensure existing clients return by supplying excellent service and quality of food and beverage. Secure new clients by providing professional communication in a timely manner. Manage events, create time lines, direct all aspects of weddings and member events. Facilitate tours of event space, create estimates, proposals, and contracts for clients. Develop menu and ensure optimal level of services for all projects and events. Detail all aspects of every event for each clients specific needs and desires. Responsible for all catering operations to include booking, preparation and service at events. Collaborated with executive chef to develop and cost out menus for all catering events. 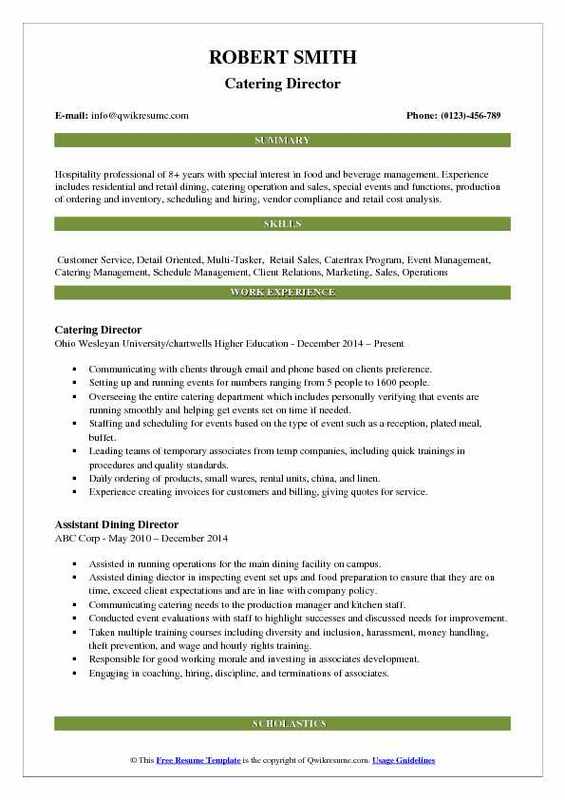 Headline : Strong sales professional with over 5 years of experience in Food Service and currently looking for Management in Food Service, Catering, Payroll, Concessions, or any Related Fields. I posses entrepreneurial vision and leadership skills to drive expansion. Effective at multitasking and reaching sales targets. Builds loyalty and long-term relationships with customers. Supervise catering operations including: booking events, supervising sales/support staff, developing, selecting and costing menus, pricing, staff selection/development, and departmental administration. Supervise all aspects of preparation, service, and cleanup for day to day catering operations. Directly supervise catering staff with responsibility for hiring, training, discipline, communication, performance management, retention, and administration. Forecast catering sales and develops strategies/plans for achieving sales goals, including implementation of a comprehensive marketing plan with associated collateral. Responsible for timely and accurate reporting and communication of all catering related revenue, expenses, and receivables. Interact with college management while maintaining effective client and customer relations at all levels. Keep informed of and advise client, customers, and staff on current catering trends and products. Ensure implementation of and adherence to all aramark opx catering initiatives and guidelines.